This beautiful Mother Mary stamp from Stampendous, reminds us of the reason for the season. It's paired with the new 8 x 8 DECOR Music stamp to make a watercolor background and the Encrusted Blue Jewel Kit to make a sparkly panel to layer with. 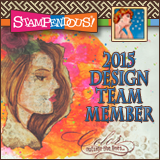 All week the Stampendous Design Team will be sharing their "Reason for the Season" cards so be sure to stop by the Stampendous Blog to see all of the beautiful creations. 1. 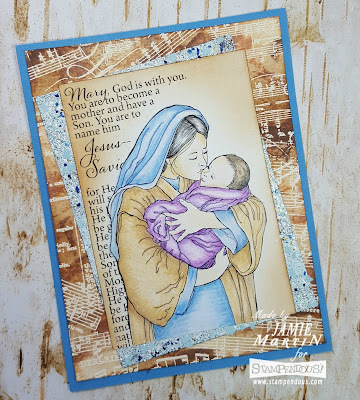 Stamp Mother Mary on cream cardstock with black ink and color with colored pencils. 2. Sponge edges with Antique Linen ink and set aside. Stamp DECOR Music on watercolor paper with VersaMark ink and emboss with white embossing powder. 3. Rub Antique Linen, Tea Dye and Walnut Stain inks directly onto embossed pieces, then spray with water so the inks blend. Let dry. 4. Once dry, stick a panel of Sticky Panels diagonally on to this then lay the stamped piece on top. Sprinkle the exposed Sticky Panel's with elements from the Encrusted Jewel Blue Kit and emboss. 5. Mount to a blue card. 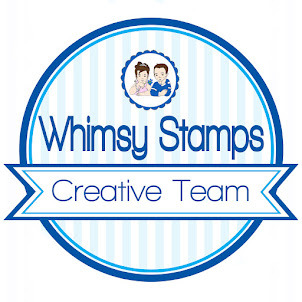 Disclaimer- I get free goodies for blogging about craft products! How lovely and endearing. The musical background is especially sweet - what young mother doesn't feel the music of the soul upon holding her baby? Beautifully colored in pastels, too! Beautiful. 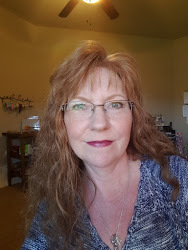 I like the layers and your soft coloring. So beautiful. I like how you colored the image in soft, delicate colors. It is prefect for the scene of Mary and her love of Jesus. 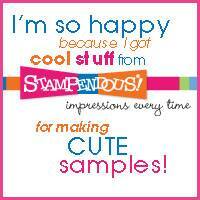 Love that new stamp & your background pieces are wonderful! Lovely coloring on your beautiful card! The layering is so pretty. Your card is so beautiful. Love the stamp and your coloring is really amazing. Beautiful stamp, and the way you colored it is sheer perfection! Show stopper of a card; Absolutely Stunning. Beautiful coloring on your card by the way.